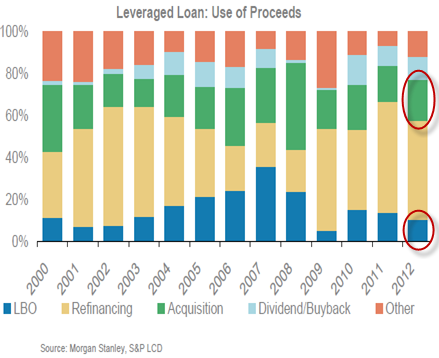 The leveraged finance new issuance continues to stay intact. 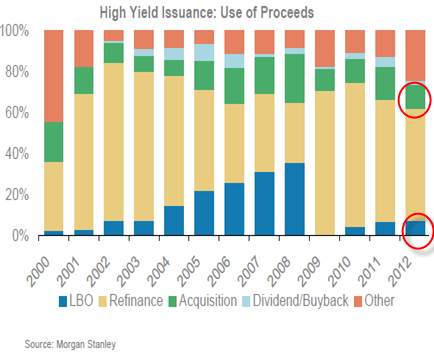 We've had $167bn of HY bonds and $117bn of institutional leveraged loans issued so far this year. JPmorgan is forecasting lighter volume for the second half, but still decent amount of activity - see chart below. The use of proceeds however shows caution, with the bulk of new issuance going toward refinancing (at ridiculously low rates) as well as capex. LBO and even M&A activity is still subdued. Transactions such as KKR's Walgreen's 45 percent acquisition of Alliance Boots for $6.7 billion are quite rare. Leveraged transactions require confidence in earnings growth/stability. And right now confidence is one ingredient that is missing, which holding back new deals.